Listed below are the meanings of the most common Welsh language words and phrases found on gravestones in Wales. Click on the daffodil to return to my Welsh Family History Archive menu page. 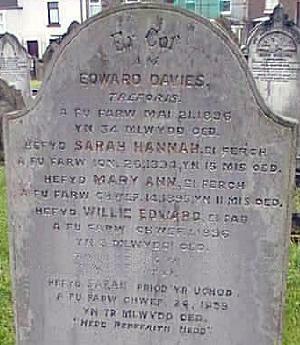 The inscriptions on gravestones in Welsh churchyards, cemeteries and chapel burial yards are frequently written in the Welsh language, as in the example quoted here. At first sight, this may confound non Welsh-speaking family historians, but checking through the lists of Welsh words and phrases provided below should enable most such inscriptions to be understood. When you've studied the lists, scroll down the page and test your skills on an authentic Welsh monumental inscription. Translate this authentic monumental inscription, taken from the tombstone (right) in the graveyard of Capel Seion Newydd - Eglwys y Bedyddwyr Treforys (New Zion Chapel - Morriston Baptist Church) in Morriston, Swansea, Glamorgan. Note: The "/" forward slash symbol is used in transcriptions of monumental inscriptions as an end-of-line marker.